This week's Smackdown was dominated by the McMahon-Helmsley regime, with WWE COO Triple H punishing a number of wrestlers throughout the show. Seeing the main storyline in WWE carry over on Smackdown, something we didn't get when John Cena was WWE Champion, allows the show to feel much more important, although it does reduce the worth of the World Heavyweight Championship to the brand and the company as a whole as Alberto Del Rio's reign continues to be an afterthought on television. The show kicked off with Miz TV, as The Miz welcomed Big Show and Dolph Ziggler to the show. Over recent weeks, we've seen both Show and Ziggler become victims of Triple H's group, with both forced to watch The Shield and Randy Orton destroy Daniel Bryan on Raw. With The Miz asking the questions, it was clear that he going to get nothing out of Show or Ziggler who were both scared of losing there jobs, with a really awkward atmosphere created because of this. With The Miz about to have his say, WWE COO Triple H's music hit (he's fittingly using Motorhead's King of Kings again) and The Game headed down to the ring. With Triple H began ripping into Miz, Show and Ziggler, with more “Best for Business” schtick that is sure to wind up a lot of the fans. I have to say I actually found Miz fairly likeable in this segment when he stood up to Triple H, for me it was the first time that The Miz has looked comfortable as a face, I thought I would hate seeing him opposite Triple H, but he actually plays the underdog role quiet well. 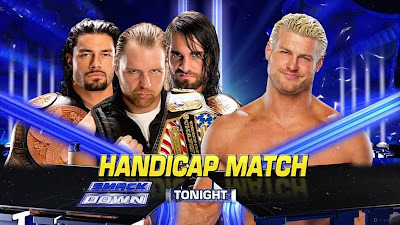 With Triple H throwing his weight around he place Ziggler in a Handicap match against The Shield later on (more on that later), forced Big Show to sit at ringside for the entire show and placed The Miz in a match against WWE Champion Randy Orton. I thought this was pretty strong opening segment, that set up the premise of the show well and put together two big matches, you can't do much more than that. The match between Miz and Orton was actually a lot better than I imagined it would be. Orton looked great when in control of the match, and knows the little things he can do that will get the crowd to react against him. Whilst The Miz's selling is still questionable as a face, his comeback in the early part of the bout was decent, with a reversal of Orton's Rope Hung DDT into a back body drop over the top rope being well worked. With Miz now in control, The Shield headed down to ringside and we went to commercial break. With The Shield now standing guard, Orton was back in control of the bout, with his regular headlock wearing Miz down. Orton is still over reliant on that rest hold, especially during televised bouts, it would be nice to see him use a few different holds in his matches. By far the best section of the match, was Miz's last comeback attempt, which was pacy and featured a number of nice reversals and near falls, the best of these seeing Miz reverse an RKO attempt into a backslide for a two count. The ending of the bout, saw Miz begin to focus his attack on Orton's legs before placing him the Figure Four Leg Lock, with Orton spending some time in the hold before finally making it to the ropes. With Orton hanging Miz on the top rope, The Viper slithered back into the ring to hitting an RKO for a pinfall victory. Pretty decent finish, Orton had to win to keep him looking strong, whilst The Miz was elevated by being in the ring in a competitive contest against the WWE Champion, certainly one of The Miz's best performances since turning face. Hopefully we'll see The Miz continue this way, although I feel that without a strong heel to go up against, he'll return to his unlikeable smarmy ways, unfortunately. Straight after Bryan made the save for The Miz, we headed backstage to fuming Smackdown General Manager Vickie Guerrero, who called Bryan a bully, and placed him in a match with Ryback later in the show. It's good to see Guerrero back as a full blown heel, as that is definitely where she does her best work, she's easy to hate, even if she has less power than we've seen her with before on Smackdown. Ryback also turned up, to further wind up Bryan, with a bizarre promo about how he didn't like bullies. It wasn't particularly the content of Ryback's speech, it was the fact he wasn't looking at Bryan, and was staring in the distance, I don't know, as if someone was holding up his lines for someone to read. It made the segment difficult to watch, and instantly I was out of the storyline wondering what the hell Ryback was doing. 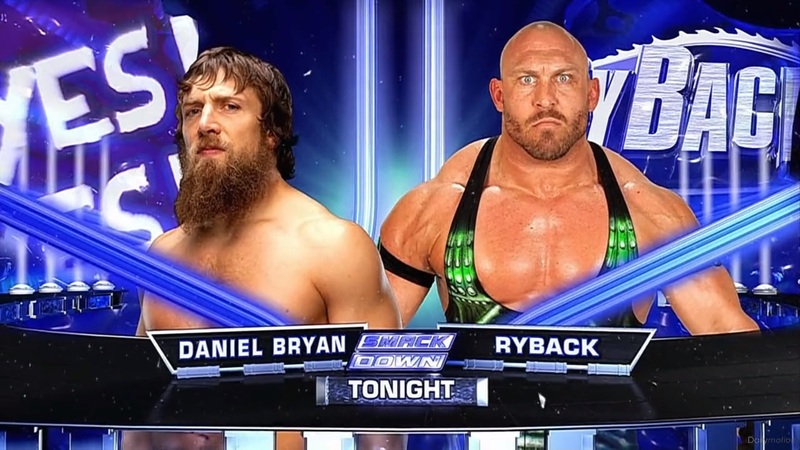 Luckily for Ryback, he redeemed himself with a good match against Bryan. We've seen these two go at on television a handful of times before, their last encounter coming on 22nd July as part of Bryan's famous Gauntlet Match, and each time they've locked up they've put on an entertaining match. Bryan's size allow Ryback to look completely dominate in the opening stages, with a sick tilt a whirl slam really showing this off, whilst Bryan's selling also allows the fans to easily get behind him as an underdog, as he builds to a comeback. With Bryan mid comeback, following a suicide dive that sent Ryback into the announce table, Randy Orton headed back into the arena but keep his distance on the ramp, for now. This allowed for another ncie momentum shift, with Ryback back to bullying Bryan around the ring, Ryback works pretty well in this role, with him laughing in Bryan's face and taking him lightly, making the fans get even further behind The Submission Specialist. The finish saw Bryan regain control, delivering a number of signature moves to Ryback, with the crowd behind him every step of the way. After Bryan's Yes Kicks gained him a near fall, he locked Ryback in the Yes Lock, but with The Human Wrecking Ball close to submission, Orton finally made his presence known attacking Bryan to give Bryan the disqualification victory. However, Orton quickly ended up in the Yes Lock himself, showing the fans a quick glimpse of what could happen when Bryan had Orton to himself, only for The Shield to re-enter the fray, breaking the hold and putting the boots to Bryan. Big Show had finally seen enough and entered the ring to state down with Orton and The Shield. Of course, Big Show knew he couldn't do anything, and Triple H made it even more clear. The Game headed down to the ring and forced Big Show to leave, with another great performance from Big Show, holding back tears and emotions to keep his job. This was incredibly uncomfortable viewing with The Shield and Orton berating Bryan, with The Shield holding Bryan up for Orton to deliver a series of punches and kick to, before The Shield finished him off with a Triple Powerbomb. The deck was so heavily stacked against Bryan once again, so this beating will only help him get even further over with the fans, as we build towards an inevitable triumph for the new ultimate underdog. The humiliation continued for Bryan, when Orton spray painted the words “NO” on his chest to close the show, with Orton holding the WWE Championship above his head. Overall, this was strong closing segment to the show, which was uncomfortable in an uncomfortable way, it's not often in WWE that I'll find myself fully into the kayfabe like this, but who doesn't want to see Bryan kick Orton's arse and get his revenge on Triple H? Elsewhere on Smackdown, Rob Van Dam, accompanied to the ring by Ricardo Rodriguez was back on form as he took on World Heavyweight Championship Money in the Bank Winner Damien Sandow in a short bout. Van Dam was much better in this contest, than he was against World Heavyweight Champion Alberto Del Rio on Raw this week, looking alert and nailing all his moves. Sandow got in limited offence, with the Cubito Aequet his closest chance for victory. The finish saw Van Dam reverse Sandow's attempt to send him into the top turnbuckle, with a stiff kick to the head, before he managed to perform the spot he botched against Del Rio on Raw, with Van Dam placing Sandow on the top rope, for a good looking diving thrust kick. Van Dam picked up the pinfall victory following a Five Star Frog Splash. Sandow is yet to win a match on Raw or Smackdown since winning the Money in the Bank briefcase, in fact, you have to go back to 10th June episode of Raw, where Sandow defeated Sin Cara for a victory from the Money in the Bank holder. WWE has a tendency to give the World Heavyweight Championship Money in the Bank winner a losing streak after winning the briefcase, we've seen it with Jack Swagger, Daniel Bryan and Dolph Ziggler in the past and none of those had a particularly healthy World Heavyweight Championship reign, WWE need to be careful the same doesn't happen to the Intellectual Saviour of the Masses. After the match, Alberto Del Rio came out on the ramp, to cut a promo on his Night of Champions opponent. Del Rio's effort was a solid heel promo, but was certainly more concerned with his former associate Rodriguez than he was with Van Dam, who risks becoming a side show for Del Rio and Rodriguez to play out their rivalry. Without giving the Van Dam or Rodriguez the chance to reply to Del Rio, bar the two getting an RVD chant going, it left me wanting more interaction between the three, which is a good thing, I guess. At least this match has had more build up than Del Rio vs. Christian at SummerSlam, but with two week's of WWE television to go, I'm not quite sure where they are going to take this story. Paul Heyman and Intercontinental Champion Curtis Axel also turned up on Smackdown to talk about the beating they delivered to CM Punk on Raw. After Axel had delivered a decent short promo, we got into the real meat of the segment with Heyman allowed to really stretch his promo muscles. Firstly, aiming the promo at the WWE fan, blaming them for the attack on Punk due to the WWE App vote, giving him no other choice, getting a ton of heat from the Las Vegas crowd. Then Heyman turned his attention to Punk, revealing he was scared of what could happen in the Handicap Elimination match at Night of Champions, because he could receive the beating of his life. Heyman finished off by saying all his previous action against Punk were merely out of fatherly love, so imagine what he could do when faced with the beating of his life. It's now simply a formality that when Paul Heyman get's a microphone in his hand, that he will produce an excellent promo. Everything here, from the content to his tone of voice, his facial expressions to his delivery was spot on. The Wyatt Family were back in action this week, as Erick Rowan and Luke Harper took on Tons of Funk. We've seen this match twice before on television, and this was the most competitive bout for Brodus Clay and Tensai who looked to be on a role, before Erick Rowan pulled Clay out of the ring. This allowed Harper and Rowan to take advantage and after a Discus Clothesline from Harper, Rowan picked up the victory with a big splash for the pinfall. Bray Wyatt then entered the ring and hit Sister Abigail on Tensai to close the segment. The Wyatt Family seem to be treading water as of late, with no real direction heading into Night of Champions, I'd expect that WWE creative are waiting for Kane to finish filming See No Evil 2, so the Family can pick up their feud with the Big Red Monster. In a match made by Triple H earlier in the show, Dolph Ziggler had a rematch against The Shield in a One-on-Three handicap match. It was another top notch contest, that was more entertaining than it should have been. Ziggler works as a great underdog character, because his selling so good, but everytime Ziggler got some momentum it would quickly be cut short by The Shield. Some nice wrestling action throughout, with a section between Ziggler and United States Champion Dean Ambrose being especially good, the idea of seeing those two in one on one action is surely something most wrestling fans are dying to see already, with Ambrose taking a sick bump off a back body drop over the top rope from Ziggler. The finish saw Ziggler attempt a Fame-Asser on Tag Team Champion Seth Rollins, which was reversed into a Buckle Bomb, before Tag Team Champion Roman Reigns hit a thunderous spear to pick up the pinfall victory for The Shield. The only drawback of this match, was the number of times the camera would cut to Big Show at ringside, I know Big Show is there, you don't need to keep showing me! Plus judging by his reaction and the number of Ziggler T-Shirts in the crowd, Ziggler doesn't need Big Show's reaction to help get him over with the fans. After taunting Show, The Shield hit Ziggler with a Triple Powerbomb to close the segment. We also got more vignettes for Los Matadores. I say more, it was the exact same promo they've been showing the last two weeks, twice. I'm more hyped up for the repackaged Epico and Primo, than I was the first time they showed the vignettes. Give me some different please, more information on the tag team, when they're going to debut, or why being bull fighter will help them in WWE...anything! 1. The Miz can be a likeable face when positioned against the right people. 2. WWE television has been incredibly uncomfortable at time in the last few weeks, but in a good way. 3. We still need to hear more about the Rob Van Dam/Ricardo Rodriguez partnership.